To begin with, each item that you want to hide/show should have a unique HTML ID. Let's begin with a very simple HTML page. 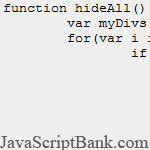 That function, when called, will hide all of the divs that are included in the "myDivs" array. However, we need a way to show the appropriate divs again, so we are going to modify the function slightly to insert a new link where the div should be. Now that we've inserted links that will show the divs, we need to actually write the function that's going to reveal the div when the link is clicked.